On 17 August, Barcelona will host the remembrance ceremony for the first anniversary of the attacks in Barcelona and Cambrils, which left 16 dead and over one hundred injured, with the slogan ‘Barcelona, City of Peace’, which reaffirms the commitment to being a city of peace, welcome and integrity. Barcelona City Council, with the collaboration of the Generalitat (Government of Catalonia) and the delegation of the Spanish Government in Catalonia, has promoted and organised the event in remembrance and solidarity with the victims of the attacks on 17 August, which will take place at Plaça de Catalunya, along with a wreath-laying ceremony on La Rambla. The city councils of Cambrils and Ripoll, as well as Alcanar and Subirats, will also have an institutional presence at the ceremony. As will Rubí, Sant Hipòlit de Voltregà, Vilafranca del Penedès and Zaragoza, municipalities where victims lived, and members of all the police forces, emergency services and other public services who contributed to assisting at the attacks. At this ceremony, with no official speeches, the focus will be on the relatives of the victims and those injured in the attacks. The commemorative ceremony for the first anniversary of the attacks will be held on Friday 17 August at 10.30 am in Plaça de Catalunya. ‘Barcelona, City of Peace, Ceremony in remembrance and solidarity with the victims of the attacks on 17 August’, has been coordinated by the Commissioner for Memory Programmes. Beforehand, at approximately 10 am, a wreath-laying ceremony is planned by the Joan Miró mosaic on La Rambla, at Pla de l’Òs, with relatives of the victims. The media accreditation period for access to the press area set up in Plaça Catalunya will be open until Tuesday 14 August at 5 pm. No people or mobile units will be accredited outside this time limit. The registration form is now closed. The accreditations will be confirmed by email from 6pm on Tuesday 14 August, once the accreditation period is over. – At Barcelona City Hall (access through Plaça de Sant Miquel) on Thursday 16 August from 10 am to 5 pm. 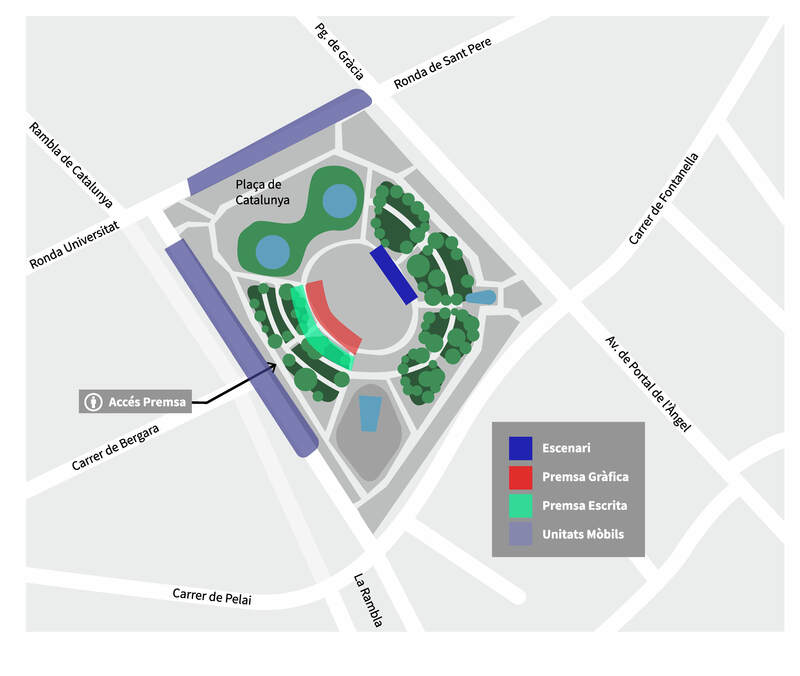 The wreath-laying ceremony with relatives of the victims will be at 10 am by the Joan Miró mosaic, at Pla de l’Òs on La Rambla. Media interested in covering this moment will have a space provided. Access to this area must be before 9.30 am. Once the event is over, the media will have a shuttle bus available to take them to Plaça de Catalunya. Parking for mobile units will be provided in the areas specified on the map. To certify the mobile units and the technicians or staff of the mobile unit, you must send the information with the previous form, indicating the vehicle’s registration number. You must fill in the form for each of the technicians or staff of the mobile unit, indicating the vehicle’s registration number. IMPORTANT: The assembly of mobile units must be completed before 9 am on Friday 17 August. Access will not be permitted to any more vehicles after that time.